Why Won't the National Election Pool Release Unadjusted Exit Polls? JFK: Debunking Scott Aaronson's "Twenty Reasons to Believe Oswald Acted Alone"
JFK Assassination Fritz Notes: Oswald said he was "out front with Bill Shelley"
JFK Assassination: Was Oswald Standing in the Doorway of the Texas School Book Depository at 12:30? JFK: REELZ’s Nonsensical "Smoking Gun", the Parkland Doctors and "Executive Action"
JFK: "Parkland", Dr. Charles Crenshaw and "Executive Action"
How Many of the Following Must be True to Prove a JFK Conspiracy? The unadjusted 2004 National Exit Poll: closing the book on "False Recall"
2012 Late Recorded Votes: Confirmation of the True Vote? Final Presidential 2012 Forecast: Is there just ONE Pundit Who Considered the Fraud Factor? True Vote Model Scenarios: What will it take for Romney to win? Links to posts, models, statistical analysis, exit poll timelines, articles and True Vote analysis tables follow this summary. I have written two books on election fraud which prove that the recorded vote is always different from the True Vote. Unlike the misinformation spread in the media, voting machine “glitches” are not due to machine failures. It’s the fault of the humans who program them. In the 1968-2012 Presidential elections, the Republicans won the average recorded vote by 48.7-45.8%. The 1968-2012 Recursive National True Vote Model indicates the Democrats won the True Vote by 49.6-45.0% - a 7.5% margin discrepancy. P= .000000000 000000000 000000000 000000000 000000000 000000000 000000000 000000000 000000000 000000000 000005. Election forecasters, academics, political scientists and main stream media pundits never discuss or analyze the statistical evidence that proves election fraud is systemic - beyond a reasonable doubt. This site contains a compilation of presidential, congressional and senate election analyses based on pre-election polls, unadjusted exit polls and associated True Vote Models. Those who never discuss or analyze Election Fraud should focus on the factual statistical data and run the models. If anyone wants to refute the analytical evidence, they are encouraged to do so in a response. Election forecasters, academics and political scientists are welcome to peer review the content. The bedrock of the evidence derives from this undisputed fact: Final national and state exit polls are always forced to match the recorded vote – even if doing so requires an impossible turnout of prior election voters and implausible vote shares. All demographic categories are adjusted to conform to the recorded vote. To use these forced final exit polls as the basis for election research is unscientific and irresponsible. The research is based on the bogus premise that the recorded vote is sacrosanct and represents how people actually voted. Nothing can be further from the truth. It is often stated that exit polls were very accurate in elections prior to 2004 but have deviated sharply from the recorded vote since. That is a misconception. The UNADJUSTED exit polls have ALWAYS been accurate and closely matched the True Vote in 1988-2008. A comparison of ADJUSTED, PUBLISHED exit polls in elections prior to 2004 and PRELIMINARY exit polls since then is like comparing apples to oranges. The adjusted, published exit polls have always exactly matched the fraudulent RECORDED vote because they have been forced to do so. That's why they APPEAR to have been accurate. The RECORDED vote has deviated from the TRUE VOTE in EVERY election since 1968 – always favoring the Republicans. In 1992, Clinton defeated Bush by 5.8 million recorded votes (43.0-37.5%). Approximately 9 million were uncounted. The National Exit Poll was forced to match the recorded vote with an impossible 119% turnout of living 1988 Bush voters in 1992. The unadjusted state exit polls had Clinton winning a 16 million vote landslide (47.6-31.7%). The True Vote Model indicates that Clinton won by 51-30% with 19% voting for third party candidate Ross Perot. In 1996, Clinton defeated Dole by 8.6 million recorded votes (49.3-40.7%); 9 million were uncounted. The unadjusted state exit polls (70,000 respondents) had Clinton winning a 16 million vote landslide (52.6-37.1%). The True Vote Model indicates that Clinton had 53.6%. In 2000, Al Gore won the 540,000 recorded votes (48.4-47.9%). But the unadjusted state exit polls (58,000 respondents) indicated he won by 50.8-44.4%, a 6 million vote margin. There were nearly 6 million uncounted votes. The True Vote Model had him winning by 51.5-44.7%. But the Supreme Court awarded the election to Bush (271-267 EV). In Florida, 185,000 ballots were uncounted. The following states flipped from Gore in the exit poll to Bush in the recorded vote: AL AR AZ CO FL GA MO NC TN TX VA. Gore would have won the election if he captured just one of the states. Democracy died in this election. In July 2004 I began posting weekly 2004 Election Model projections based on the state and national polls. The model was the first to use Monte Carlo Simulation and sensitivity analysis to calculate the probability of winning the electoral vote. The final projection had Kerry winning 337 electoral votes and 51.8% of the two-party vote, closely matching the unadjusted exit polls. The Final 2004 National Exit Poll was mathematically impossible since it indicated that there were 52.6 million returning Bush 2000 voters - but he had just 50.5 million recorded votes. Only 48 million were alive in 2004. Approximately 46 million voted, therefore the Final overstated the number of returning Bush voters by 6-7 million. The Final NEP implied that there was an impossible 110% turnout of living 2000 Bush voters in 2004. The post-election True Vote Model calculated a feasible turnout of living 2000 voters based on Census total votes cast (recorded plus net uncounted), a 1.25% annual mortality rate and 98% Gore/Bush voter turnout. It determined that Kerry won by 67-57 million and had 379 EV. But there was much further confirmation of a Kerry landslide. Consider Final NEP adjustments made to Bush’s approval rating and Party–ID crosstabs. Bush had a 48% national approval rating in the final 11 pre-election polls. But the Final NEP indicated that he had a 53% rating – even though he had just 50% in the unadjusted state exit poll weighted aggregate. Given the 3% differential between the Final NEP and state exit poll approval ratings, let’s deduct 3% from his 48% pre-election approval, giving him a 45% vote share. That is a virtual match to the True Vote Model (which Kerry won by 53.5-45.5%). The exit pollsters inflated Bush’s final pre-election 48% average rating by 5% in the Final NEP order to force a match to the recorded vote - and perpetuate the fraud. Kerry’s 51.7% unadjusted state exit poll aggregate understated his True Vote Model share. There was a near-perfect 0.99 correlation ratio between Bush‘s state approval and unadjusted exit poll share. The unadjusted state exit poll aggregate Democratic/Republican Party ID split was 38.8-35.1%. As they did in all demographic crosstabs, the pollsters had to force the Final National Exit Poll to match the recorded vote; they needed to specify a bogus 37-37% split. The correlation between state Republican Party ID and the Bush unadjusted shares was a near-perfect 0.93. This chart displays the state unadjusted Bush exit poll share, approval ratings and Party-ID. The 2008 Election Model projection exactly matched Obama’s 365 electoral votes and was within 0.2% of his 52.9% share (a 9.5 million margin). But the model understated his True Vote. The forecast was based on final likely voter (LV) polls that had Obama leading by 7%. The registered voter (RV) polls had him up by 13% - before undecided voter allocation. The landslide was denied. The Final 2008 National Exit Poll was forced to match the recorded vote by indicating an impossible 103% turnout of living Bush 2004 voters and 12 million more returning Bush than Kerry voters. Given Kerry’s 5% unadjusted 2004 exit poll and 8% True Vote margin, one would expect 7 million more returning Kerry than Bush voters – a 19 million discrepancy from the Final 2008 NEP. Another anomaly: The Final 2008 NEP indicated there were 5 million returning third party voters - but only 1.2 million were recorded in 2004. Either the 2008 NEP or the 2004 recorded third-party vote share (or both) was wrong. The True Vote Model determined that Obama won by over 22 million votes with 420 EV. His 58% share was within 0.1% of the unadjusted state exit poll aggregate (83,000 respondents). In the 2010 Midterms, the statistical evidence indicates that many elections for House, Senate and Governor were stolen. The Wisconsin True Vote Model contains worksheets for Senate, Governor, Supreme Court and Recall elections. A serious analyst can run them and see why it is likely that they were stolen. In 2012, Obama won the recorded vote by 51.0-47.2% (5.0 million vote margin) and once again overcame the built-in 5% fraud factor. The 2012 Presidential True Vote and Election Fraud Simulation Model exactly forecast Obama’s 332 electoral vote based on the state pre-election polls. The built-in True Vote Model projected that Obama would win by 56-42% with 391 electoral votes. But just 31 states were exit polled, therefore a comparison between the True Vote Model and the state and national unadjusted exit polls (i.e. the red-shift) is not possible. Obama won the 11.7 million Late votes recorded after Election Day by 58-38%. In 2008, he won the 10.2 million late votes by 59-37%, a confirmation that he was within 2% of his 2008 share. A Reply to Howard Stanislevic's "Return to Innocence"
Miami-Herald: Gore won Florida by 46,000 votes! The 2006 US Midterms: Another Stolen Election? This refutes the myth that early exit polls were biased to Kerry. He led from 4pm with 51% (8,349 respondents) to the final 13,660 (51.7%). The exit pollsters had to switch approximately 471 (6.7%) of Kerry’s 7,064 responders to Bush in order to force the Final NEP to match the recorded vote. Given his 51.7% share of 125.7 million (Census) votes cast, Kerry won by nearly 6 million votes.The True Vote Model indicates he had 53.6% and won by 10 million. The Final was forced to match recorded vote by switching 471 (6.7%) of Kerry’s 7,064 respondents to Bush. The average within precinct discrepancy (WPD) was a nearly identical 6.5%. The True Vote Model indicates that Kerry had 53.6%. Final National Exit Poll, 17836 respondents (adjusted to match the recorded vote). The True Vote Model indicates that Obama had 58%. 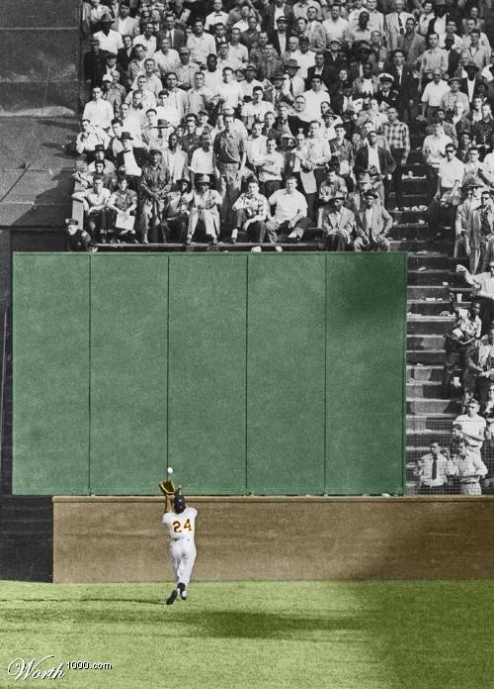 In the first game of the 1954 World Series, Willie Mays made a miracle over-the-head catch. He implicitly calculated the mathematical trajectory of the ball at the crack of the bat using his built-in computer. Calculating the True Vote is more complex; the trajectory equation changes over time as the dynamics of the electorate change. The current election equation is a recursive function of the prior. It's all in the MATH. Method 1: the Final NEP adjusts the mix to force a match to the recorded vote. This implicitly assumes that all elections, not just the current, are fraud-free. The process of matching to the official vote required millions of Bush phantom voters in 1988, 1992, 2004 and 2008 (turnout exceeded 100%). The official vote counts cannot be correct. Method 2: The mix is based on prior recorded votes and does not include millions of uncounted votes. Method 3: (True Vote): The mix is based on total votes cast in the previous and current election. Method 4 (Recursive True Vote): The problem of the Final National Exit Poll perpetuating endemic fraud is eliminated. Starting with the 1968 election, the model sequentially derives a feasible returning vote mix. True vote shares cast in the previous election are reduced by voter mortality and turnout in the current election and new voters are added to the mix. Except for the 2004 election, the model used Final National Exit Poll vote share. In 2004 the Final NEP vote shares were radically changed to match the official tally. Therefore, preliminary 12:22am NEP vote shares were used to calculate the True Vote. The model indicates that two elections were definitely stolen (2000 and 2004) and probably two others (1968 and 1988) as well. In order to match the official vote, there had to be an average 94% turnout of returning Democrats and 106% of Republicans. The average Republican turnout was 114% when Nixon and Bush were the incumbents; it was 98% otherwise. The average True Vote discrepancy was 10.3% when Nixon and Bush were incumbents; it was 3.6% otherwise. In 1968, Nixon won the official vote by 0.5m. Humphrey won the True Vote by 2 million. There were 6 million uncounted votes. In 1972, Nixon won a 17 million landslide with 61.8% of the vote. His True Vote share was 57%. There were 9.5 million uncounted votes. In 1976, Carter won the official vote by 1.7m. He won the True Vote by 6 million with 53%. There were 6.7 million uncounted votes. In 1980, Reagan defeated Carter by 8 million votes. There were 6.4 million uncounted votes. In 1984, Reagan defeated Mondale by 17 million votes. There were 9.2 million uncounted votes. In 1988, Bush won the official vote by 7.0m. Dukakis may have won a squeaker. There were 10.6 million uncounted votes. In 1992, Clinton won the official vote by 6m. He won the True Vote by over 20 million. Independent candidate Ross Perot had 19% of the recorded vote. In 1996, Clinton won the official vote by 8m. He won the True Vote by 16 million. There were 8.7 million uncounted votes. Independent candidate Ross Perot had 10% of the vote. In 2000, Gore won the official vote by 0.54 million. He won the True Vote by 4 million. There were 5.4 million uncounted votes. But he lost in Scotus by ONE vote. In 2004, Bush won the official vote by 3.0m. Kerry won the True Vote by 10 million. The Final National Exit Poll forced a match to the recorded vote. It had an impossible 43/37% Bush/Gore returning voter split. There were 3.4 million net uncounted votes. HAVA guess how many were stuffed or switched? In 2008, Obama won the official vote by 9.5m. It had an impossible 46/37% Bush/Kerry returning voter split. True Vote for candidate k in election i is sum product of the mix and vote shares. The True Vote calculations used the same Final 2008 National Exit Poll vote shares that were forced to match the recorded vote. So there can be no argument there. The 103% turnout of living 2004 Bush voters as indicated in the Final 2008 NEP was impossible. The 5.25 million returning 2004 third-party voters as indicated in the Final 2008 NEP was impossible. Impossible 2004 (110%) and 2008 (103%) returning voter turnout was replaced by feasible 98% and 97% rates. It was the most outrageous election theft in history-until 2004.